Heat a frying pan over a fairly high heat, then add 1 tablespoon of the Emerald Oils rapeseed oil. Add the sliced scallops and cook lightly for about 30 seconds on each side, until just browned. Remove from the pan and keep warm. In the same pan, cook the bacon for a few minutes until nicely browned, turning occasionally. Meanwhile, place the salad leaves in a large bowl and season to taste with sea salt and pepper. Remove the bacon from the pan with a slotted spoon and keep warm. Add the vinegar to the pan, raise the heat and deglaze the pan, scraping the sediment with a wooden spatula until almost all the vinegar has evaporated. Add the mustard and honey, then blend in the remaining tablespoon of rapeseed oil to make a dressing. 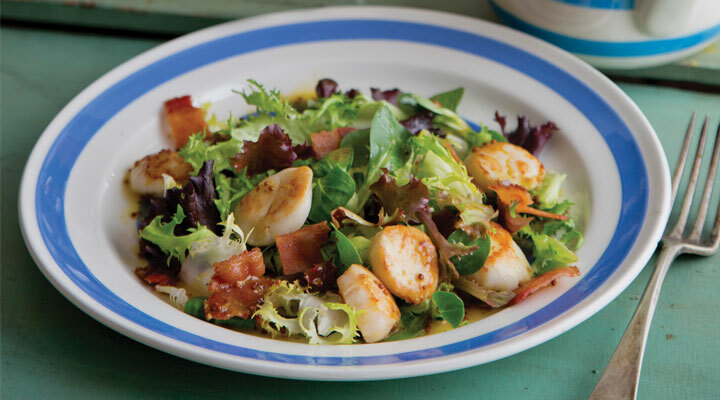 Scatter the scallops and bacon over the salad, then drizzle over the dressing. Toss lightly to combine and serve on warmed wide, shallow bowls.